Hunkered around the bar Saturday night at Harbourside Place, the crowd cheered when the television weatherman announced Hurricane Irma was skirting around Palm Beach County. “I did all the brick work on my house. I poured my heart and soul into it. The water is going to surge to my ceiling. Those people were happy. I just kept quiet,”said the bearded 61-year-old Key West resident, scuba diver and teacher. 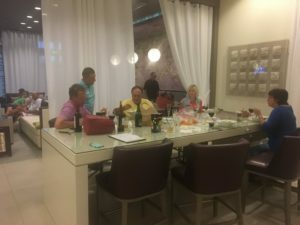 Mixed emotions — from skyscraping joy to deep sadness — were on the menu this weekend at the Wyndham Grand Hotel as guests awaited their fate from Hurricane Irma. At the bar, in the elevators, at the free popcorn stand in the lobby, the storm united strangers. Irma was a matchmaker, hooking up people who entered the hotel figuring they had nothing in common. What everybody shared was not knowing what was their future. And that not knowing brought them together. Strangers played cards together at tables. They exchanges stories — and really listened to each other — as they shared why they were there. Couples cuddled on the couch as they watched free movies in the lobby. Guests cheerfully walked up and down the stairs of the five-story hotel after the elevators were shut down for safety. “Hurricane Harvey happened. Now Hurricane Irma. Things have been so negative. Events like these bring us together,” said Chad Van Boven, a Jupiter resident who was staying at the hotel with his family and friends. The hotel workers shared in the togetherness. Irma forced many employees to leave, and only about 20 remained of the usual 60-member crew. But they made the best of it. “We’re a family. We are going to get through this together,” said hotel employee Elis Alarton, 37, who was staying at the hotel with her 15-year-old daughter, Nicole. Fellow hotel worker Amine Kais nodded in agreement. The Abacoa resident, 32, was alone after his wife and 9-month-old daughter fled Irma by driving to be with family in Atlanta. “One of our employees jumped right in to help another, even though his shift was over. I’ve gotten to know the guests. We all are a little fearful. It’s bringing us together,” Kais said. The 179-room hotel, built on the east side of the Intracoastal Waterway, was built to withstand a catagory five storm, said Harbourside Place and hotel owner Nick Mastroianni. The lights flickered a few times in the Wyndham Grand over the weekend, but there were no power outages. Hotel manager Matt Boris said he was trying extra hard to make a good impression on the guests. Many were locals making their first visit to the three-year-old hotel. Dogs – normally forbidden — were allowed. Employees and their families stayed for free for the duration of Irma. Boris asked them to be extra nice. “This is a chance to win customers for life,” Boris said. On Saturday night, Caputo and his friend, Lorie Welsh, sat at a lobby table playing cards. They had driven seven long hours from Key West. Images from the television over the bar showed Irma zeroing in on their homes. Meanwhile, a group of jolly locals were bragging about how they had dodged a bullet. But resentment wasn’t on the mind of Welsh and Caputo. “I’ve been through several hurricanes. I had a bad feeling about this one. But you know, big house, little house — in the end we’re all the same,” said Welsh, 63, who works for an author in Key West.